On Saturday, I headed dowtown to BucketWorks for BarCamp Milwaukee, not knowing what to expect. The sessions on the website looked great, but pixels and reality can often be quite different. I was not disappointed. 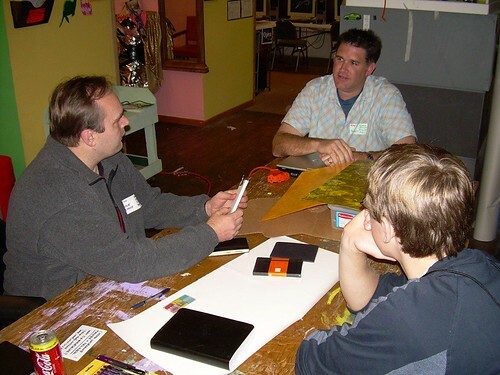 In fact, I was very impressed with the entire event, enjoying the BucketWorks space, meeting new and interesting people, enjoying challenging discussions, sharing my passions and learning new things. I arrived at BucketWorks around 2pm, and was welcomed by organizer Bob Waldron at the door. He checked me in and directed me to the schedule and main meeting area. BucketWorks occupies one floor in an old printing warehouse, with wide open spaces, heavy duty beams and old wooden floors. The space has a warm, lived-in, industrial feel which I liked very much. BucketWorks has a nice mix of both large meeting areas and small, intimate rooms, perfect for the mix of sessions on tap for the day. Sessions were already running when I arrived, so after orientation to the space and a glance at the low-tech schedule board, I dropped into a gadget roundtable with Pete Prodoehl, Jordan Arentsen and abut 8 other guys. Pete had an impressive collection of gadgets, I brought my Dana Wireless and blew several guys away when they realized it could run a browser, email client, a terminal app, IRC client and IM client. My first session of the day was a roundtable on the topic of Flat World, and its impact on society, business and culture. At first I was a little concerned as only Jordan and John December, my cohorts in the session, were in the conference room. Campers slowly filtered in, taking their seats around the long oval table. When the session started, there were roughly 15 campers participating the session. I shared My Unusual Work Life to kick off the session, then discussion ranged across many aspects of the flat world and Thomas L. Friedman's book, The World is Flat. Some highlights of the discussion: the benefits and drawbacks of working remotely for global clients, and how integral place, people and our preferred culture determine where we decide to live. I thought it was interesting that now some workers can choose the place they want to live and work, while having connections to other distant people and places. We also touched on the impact of English on the flattening world, whether machine translation would be realistic in 50 years time, debating network access as a utility, the digital divide being spawned by the flat world, how 3rd world countries might enter into the flat world, and whether flattening was good or bad. Of all the sessions I most enjoyed this one, because of the large group, varied ideas and positions from very smart people in attendance. I was reminded how fun it is to get a good thought-provoking discussion going with a group of passionate people. While this session was small, with Jordan and Dave Bost attending. A few others mentioned being interested up unavailable to attend (now I need to schedule some one-on-one demos!). it was a nice opportunity to have a more intimate discussion with Dave, who has adopted Getting Things Done and was looking for an alternative approach to managing things in his life. I showed Dave what a Moleskine was, explained how I moved from a Palm to a custom-made weekly Moleskine planner and discussed the system and how it was working out for me. Afterwards, Jordan and I had a chance to learn more about Dave's move from developer to evangelist for Microsoft, and discuss the new XAML and Windows Presentation Foundation. It was a nice time to share and discuss ideas away from the crowds. Immediately after my Moleskine demo, I was up in the meeting room again for the my Logo Design Process presentation. Jordan and I had to locate a DVI to VGA adapter from Scott Reynen, then fiddle with an old projector before I could begin. I shared my collaborative, sketch-based process with 7 campers, and had a nice Q&A and discussion time following the presentation. All of the guys had interesting questions for me about the process, and through them I came to realize how fortunate I've been to have such great logo clients. Again, a few people I knew were unable to attend, so I gave Phil Gerbyshak a personal demo beforehand, and will likely present again at the next Milwaukee Web Designer's Meetup in October. I was very encouraged by the interest in my process, and I quite enjoyed sharing my passion for logo design. 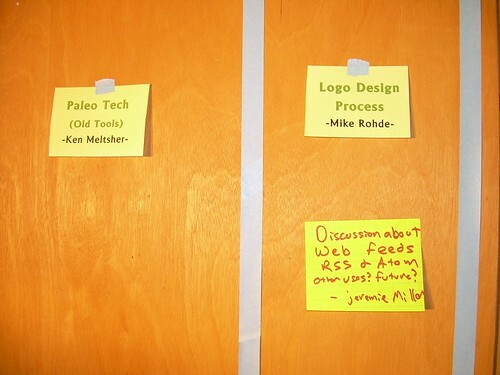 Mike Rohde's Logo Design Process (9.2MB Acrobat PDF). I appreciated the opportunity to re-connect with people I knew: Pete Prodoehl, Phil Gerbyshak, Jordan Arentsen, Chad Lawson, Ashley Dryden and Juan Valencia. I also enjoyed meeting new, interesting people like Pehr Anderson, Todd Clausen, Kevin Ciesielski, Dave Bost, Ken Meltsner, Jeremie Miller, Scott Reynen, Tegan Dowling, Clint Laskowski, and Jason Tertadian (to name a few). I think this aspect of BarCamp was my favorite part: seeing other people interested in gathering and sharing ideas on technology and life. Since I'm a pretty social person, meeting others who share similar passions or are keen on hearing about mine always gets me stoked up. 1. Reduce amount of sessions happening at the same time. I felt torn in several cases over which event to follow, and heard from several people who wanted to be in my logo design presentation but had chosen another session. I don't know if fewer sessions, fewer tracks or spreading them out over the full span is a solution for this. 2. Setup a public address system. I think it would have been helpful to have some way for organizers to announce things in all of the session areas so everyone could be on the same page. 3. Better WiFi support. The network was pretty flaky and I do know it was being hammered pretty hard — but for some of the demos a network connection was critical. 5. Consider a Friday night through Saturday Midnight timeframe. I would have loved to start on a Friday night with a dinner together somewhere and the chance to get a few sessions in afterwards, then go the full day Saturday with more sessions. Hopefully these ideas are helpful for BarCampMilwaukee 2.0. I think BarCampMilwaukee was a great success, thanks to the tireless efforts of guys like Pete Prodoehl, Bob & Luke Waldron, the BucketWorks people and many others. Thanks to you all for putting on a great un-conference for Milwaukee — I can't wait for BarCampMilwaukee 2.0! That PDF download link doesn't work (404)? Mike - it was truly great seeing you on Saturday, and sitting in on the Flat World conversation was really interesting. It started slow, but quickly picked up speed and was one of the best I attended. I agree with your suggestions for improvement. That would have really helped. Hopefully for next year's event it will be even GREATER! Phil, it was great to see you there too! I'm glad you were able to attend the flat world discussion. I appreciated your perspective in your mom in Crivitz, WI and the other questions you raised � it really made the session come alive having so many people involved. If you are ever "down under" I would love to hear your presentations and talk about organisers.